Malawian students vying for Marine Studies in Monkey Bay have accused their college director Laston Mazulu of incompetence and abuse of financial resources meant for the school. According to the students, on several occasions Electricity Supply Corporation of Malawi (Escom) and Water Board have disconnected electricity and water at the college. In an exclusive interview with Malawi24, a close source accused Mazulu of diverting funds meant for the college into his pockets and his monthly international luxurious trips. The source hinted that since the director came into control, he has failed to secure jobs for the graduates, unlike his predecessor. According to the source, his predecessor Mr Msowoya was a passionate mariner who secured jobs for all the students of 2006-2010 class by negotiating with companies. Students at Marine College angered. But since Mazulu came into power no company has reached an agreement to hire graduates. He said: “Mazulu is Mr knows it all, the whole class of 2010-2014 is still jobless and they have no hope. Instead he has ordered the college to enrol another class which will start in Jan 2016. A move which will make him rich again as he will continue diverting money meant for the college into his pockets. The college which is run by the Department of Marine Services offers 4 year advanced Diplomas in Nautical Studies and Marine Engineering. Marine companies however opt to employ those who have passed competency examinations from the Ministry of Transport. Still, Malawi government continues to spend millions of kwacha to keep students at the school for four years and the college fee is pegged at K260 thousand per year. A situation the source described as a waste of time and resources. 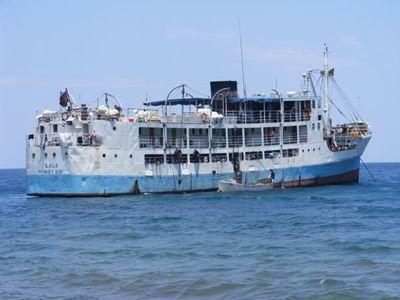 He said that marine companies in Malawi opt for cheap labour under the current director who orders the college to intensify short courses (2 months) and every December the Ministry of Transport administer competency examinations. “Students who do short courses write and easily pass the examination, the problem is that companies employ them at the expense of us who spent fours at school. If you visit Malawi shipping company and Maldeco, most of workers are JCE dropouts who went for a short course at Marine College and passed easily,” he said. A lecture who also spoke with this publication on condition of anonymity wondered what the director who is a teacher by qualification is doing at the school. He described Mazulu as someone with no passion for seafarers. “He is not a mariner. He has never been to sea and how can he be the director of marine school? He is just an administrator. That is why he has no passion for seafarers. He has his Bachelors of Education from Polytechnic. “What the department is doing is a clear manifestation of failed leaders. It pains to see graduates just loitering around after all these years spent at the college and now another class is coming in January. How are they going to be motivated? I am afraid things are off track,” said the lecture. Mazulu was appointed director by the late Bingu Wa Mutharika. U have just taken a long time pic of Ilala posting on today’s news shame.This pic has nothing to do with Mariners. How do they define incompetence yet they hav just bn admitted? Are these accusations genuine? No wonder the vessel King Fisher sank ,they are not real mariners ,guys don’t worry they will employee you after a big accident ,cheap labor has repacasions .